Three-dimensional depictions of geographic data have been around for centuries. Artistic bird’s-eye views found popularity as a way to map cities and small-extent landscapes that regular people could intuitively understand. But because these were static and could not be used directly for measurement or analysis, they were often considered mere confections, or novelties, by serious cartographers, not a means of delivering authoritative content. However, this is no longer the case since ArcGIS introduced the concept of a “scene,” which is actually more than just a 3D view. In a scene you can also control things like lighting, camera tilt, and angle of view. 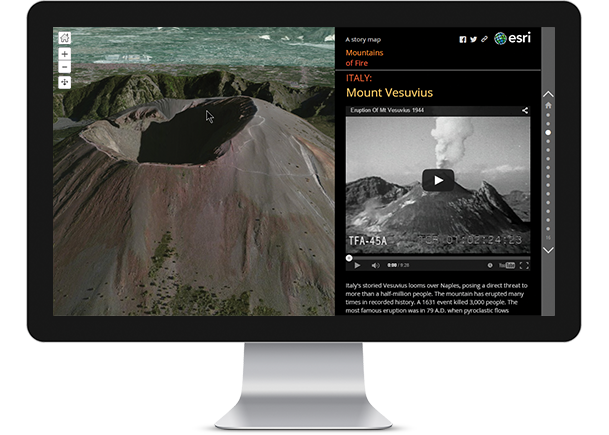 This means that the mapmaker can craft a scene that creates a highly realistic representation of geographic information in three dimensions, which provides an entirely new way for the audience to interact with geographic content. Spatial information that is inherently 3D, like the topography of the landscape, the built world, and even subsurface geology, can now be displayed in a way that is not only intuitive and visual but also quantitative and measurable, meaning we can do real analysis and hard science with 3D data. The most obvious advantage of a scene is its ability to incorporate vertical (and thus volumetric) information—the surface elevation of mountains, the surrounding landscape, the shapes of buildings, the flight paths of jetliners. It’s the power of the z-axis. This web scene was made prior to the construction of the northern addition to Building M on the Esri Redlands campus. Rather than create a detailed, 3D interior of the (still changing) floor plan, the plans were instead georeferenced in three dimensions to provide quick, interactive feedback. In 3D, the extra dimension enables you to include more readily recognized symbols and, therefore, make your maps more intuitive. You are able to see all the “data” from all viewpoints in situ. Every symbol that you recognize on a map saves you the effort of referring to the legend to make sure you understand what it shows. No need for a legend on this 3D scene. The elements like the soccer field, the palm trees, and the structures are all instantly recognizable. Many of man’s earliest maps, particularly of cities and smaller human habitations, were portrayed as scenes. These stylized maps were created as static 3D bird’s-eye views and were very successful in providing understanding of a place. Today’s GIS authors interact and see these views from many perspectives. 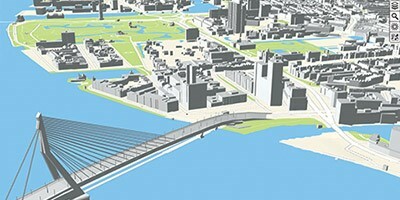 Fly like a bird through this 3D scene of the City of Rotterdam, Netherlands. For most of our living moments, we experience the world within 10 feet of the ground. 3D allows us to replicate this view. By presenting data from this approachable perspective, the size and relative positions of objects are intuitively understood by the viewer wandering virtually through the scene. There’s no need to explain that you’re in a forest or that a lake is blocking the route—the perspective immediately makes the features recognizable.